The long, sad tale of photovoltaic manufacturer AstroPower winds down? It has been a while since I posted AstroPower Saga Continues: Fraud Claims Referred to FBI. made material misstatements, engaged in fraudulent accounting practices, and signed filings made with the Commission that they knew, or were reckless in not knowing, contained materially false and misleading financial statements. The Commission alleged that at the direction of Barnett and Stiner, and in contravention of Generally Accepted Accounting Principles, AstroPower improperly recognized approximately $4 million in revenues from four transactions executed over the course of the second and third quarters of 2002. According to the Complaint, as a result of improperly recognizing revenue from these transactions, AstroPower’s net income was overstated by approximately $160,000 or 80% for the second quarter of 2002, and approximately $440,000 or 113% for the third quarter of 2002. The Commission alleged that these material misstatements of revenue and net income were included in Commission filings that Barnett and Stiner signed. Without admitting or denying the allegations in the Complaint, Barnett and Stiner consented to the entry of final judgments enjoining them from future violations of these provisions of the federal securities laws, prohibiting them from acting as officers or directors of any public company, and imposing civil penalties. Stiner, without admitting or denying the Commission’s findings, also consented to the institution of settled administrative proceedings pursuant to Rule 102(e)(3) of the Commission’s Rules of Practice suspending him from appearing or practicing before the Commission as an accountant, based on the anticipated entry of an injunction against him. I have to wonder if these sanctions, without any admission of wrong doing, are sufficient considering the severe impact of their behaviors on AstroPower stakeholders. For further though similar coverage, please see “Sun Goes Down on Solar Company Execs” by Stephen Taub at CFO.com or “Former CEO and CFO of AstroPower, Inc. Settle Fraud Charges” at the Securities Law Prof Blog. My prior posts can be found under the AstroPower and the related Blue Square Energy categories. I still see two open issues. To date, I have not seen an official resolution or statement regarding Peter Aschenbrenner under SEC investigation in AstroPower Saga as first observed in Solar Light Flashes: November 15, 2007. 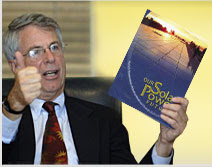 Mr. Aschenbrenner continues as the SunPower Corporation (NASDAQ:SPWRA, NASDAQ:SPWRB) Vice President, Corporate Strategy. In a final twist to the AstroPower saga, AstroPower Liquidating Trust, operated by Bridge Associates, has sued KPMG for mismanaging company audits. I noticed former Blue Square Energy CEO Jeff Barnett at the recent Cleantech Forum XXI in San Francisco, California USA. I suspect he did not see me nor care to talk with me anyway. Thanks Ed for staying on top of the Astropower story all the way through to the final details. Agree other aspects remain open ended and need more answers. Congrats to Gunther’s Blog for highlighting achievements along with the low lights of the solar industry. It is good to have people like Ed Gunther shining the light of truth so in the long term, investors of all kinds, large and small, will come to believe in the value of what this industry has to offer for the future. How did such a relatively small amount bring down the company?